For the first time since its inclusion, the Platu Class had all 4 Platus in Singapore participating in the Nationals. In addition to the Club’s Boreas and Notus, SMU Sailing ‘s SMUve and SMUmad made things more interesting on water. Despite the excellent turn-out of 10 boats in total, the weather poured cold water (literally) on Day 1, with multiple bouts of rain causing trouble on the race course. This coupled with neverending windshifts resulted in the first race only commencing after 2pm and a total of 2 races sailed for the day. In the Platu Class, Rebecca Goh’s SMUve leads the fleet with 2 bullets, fending off Notus and SMUmad – who completed both races in 2nd and 3rd respectively. She will be keeping a lookout for Pascal Radue’s Notus, who we should never write off for a comeback in day 2. 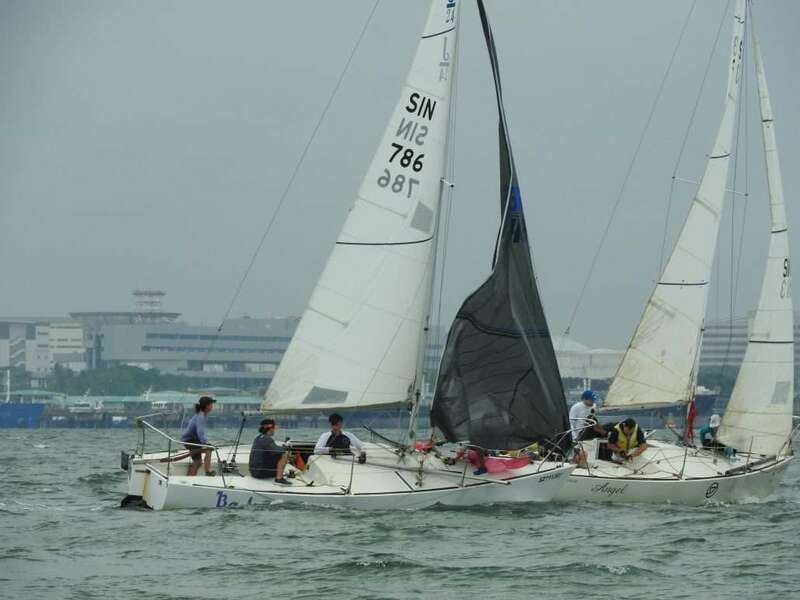 The J24s see the rest of the fleet struggling to keep up with NUS Sailing Varsity Team’s RSYC Dua, skippered by Jonathan Yeo. Dua looks more polished compared to their debut last year, and look poised to claim silverware if they keep up the good performance. Shengli sits in 2nd place on 4 points, and will try to sneak in a few bullets on day 2 to close the gap with Dua. Defending Champions Balqis tie points with RSYC Satu and Angel, as all 3 look to get back in the game for the remaining races on Day 2. With the breeze setting in early from the west, Race Organisers were eager to start on time – only to be held back for another 15mins due to a large blue vessel crossing our course. Notus looked promising after Race 3, notching a bullet to close the gap with SMUve. Unfortunately 2 more victories from SMUve in Race 4 and 5 dashed all hopes of winning for Notus in the Platu Class, having to settle for 2nd place. A consolation bullet for SMUmad in the final race secured their position in 3rd on the podium. The J24 Class saw RSYC Dua sweep the remaining 3 races, finishing the series with 5 bullets. Shengli had a small blemish in Race 4, finishing 4th, but still comfortably maintained in 2nd place overall. Completing the podium in 3rd was 2017’s defending Champions, Balqis! Congratulations to all the winners and thank you to Notus, Boreas and Balqis for flying the CSC flag high for this regatta! Also many thanks to SMU Sailing and NUS Sailing Varsity Team for bringing their boats over for this year’s Nationals, making it a record number of 10 teams this year! Enjoy the photos and see you next year!